First, some background: For the past nine years I have had my cockatiel, Penny, as my constant companion. When I first adopted her, I did not know how old she was. I have since learned that she is pretty old. I found that out when the vet who diagnosed her cancerous tumor deciphered her leg band. Every day I have had her since her tumor was removed I have thought of as a bonus day. Besides worrying that Penny will die, there’s something else happening… After nine years of living with Jonah, my male cockatiel, Penny has grown interested in him. Oh, she would mate with him several times a year, but was never affectionate with him, as she has been with me. Well, now, rather than wanting to spend all day with me on my shoulder, Penny has been wanting to stay home in her house with Jonah. It is fun to see her and Jonah preen each other, (maintain each others feathers) especially on the top of their heads where they can’t reach. Penny used to have me be her chief head scratcher, and I miss her constant companionship during the day. By the way, I don’t expect anybody to read all my ramblings, I just use my space as a type of diary sometimes. You are of course welcome to read my diary if you wish….. So, here I have been, missing the constant companionship of my cockatiel, Penny, and being afraid I will lose her. She has been my only bird who was bonded to me. Long ago, Rufus, my parrot in my banner, switched over to loving my hubby, and seeing me as a rival for his attention. So, her has been X, worrying about losing Penny, while already losing her to Jonah, the new love in her live…. …So, I initiated a long talk with my hubby… My hubby, who thinks we have enough pets already, listened to me patiently as I told him my concerns… I told him that it easier to lose a pet when we have more pets who love us, as he realized recently when Lily, his little girl dog, died… Well, I have grown accustomed to having a bird with me all the time, and that is something that my two dogs don’t really take the place of. When Penny dies, that will leave a big hole in my heart. 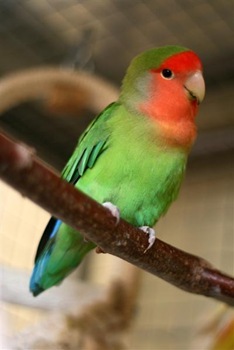 So, I told my hubby I was thinking about getting another lovebird, a young one who I could bond to me. Here’s something else that has concerned me, for many years I have taken in the needy pets, old, injured, abused, etc. The really hard part about taking in special needs pets is that there is always somebody dying. I have become too old to deal with that any more. I’m just not strong enough to do it any more with birds. The next time we get a dog, we will still adopt a (young) homeless dog, but my days of taking in old birds are over. 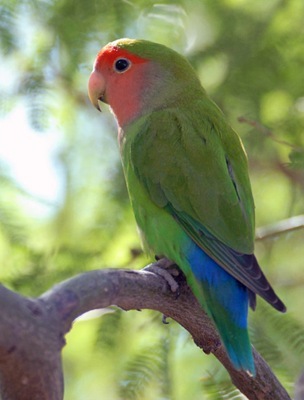 So, in talking with my hubby about all the things I have discussed in this very long post, he agreed that we would find a young lovebird for my birthday. (it’s in the summer, that’s all the details I give in cyberspace) My hubby told me that lovebirds are “Eye Candy”. To me, they are the most colorful and attractive parrots in the world. To date, I have taken in the old and homely, knowing that the young and pretty would get homes. Now, it’s my one time to be selfish, and get a young, pretty bird, who hopefully will have a long life with me. So, now we have a peach-faced lovebird named Candy, short for “Eye Candy”. She is between eight months and a year old. She has been living in my favorite pet shop most of that time. She was hand-raised as a baby, meaning that the breeder spent time with the birds to get them used to being with people. Lovebirds are great biters (as Pipsqueak was) so one who is used to humans is nice for a change. She already stood on my finger, for a few seconds, when I spent a few minutes with her at the pet shop. It didn’t take me long to decide she was the one for me. Once I got her home, I wanted to show her what the rest of the world looks like, outside of the cage in the pet shop where she had lived all her life. Well, now she is one spoiled little birdie! She just thinks she can run off to whatever room she wants. For some reason, whenever she runs out of the living room, she runs to the dining room where the bunnies stay when it is too hot outside. The bunnies prefer living outside. When the door is open, they will run outside even when it is hot or there is snow on the ground. God wired up bunnies to survive in all temperatures, but my hubby and I would rather have them inside during extreme weather. I don’t know why a little bitty bird would want to visit with great big bunnies. If anybody made it this far down, Click Here.